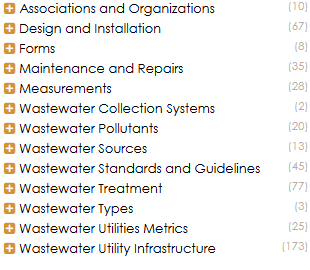 The WAND Wastewater Utilities Taxonomy is the fifth and final taxonomy in our Utilities Suite. Wastewater Utilities have the essential task of collecting, treating and then disposing of domestic and industrial sewage. Terms relating to the collection system, infrastructure, and treatment can be found in the WAND Wastewater Utilities Taxonomy. This foundation of 493 wastewater terms and 253 synonyms can be customized as well. This taxonomy includes terms relating to Wastewater Sources, Wastewater Types, and Wastewater Pollutants. Other top level terms include Design and Installation, Maintenance and Repairs, Forms, Measurements, Wastewater Standards and Guidelines, Associations and Organizations, Wastewater Utilities Metrics. Don't miss our recently released WAND Water Utilities Taxonomy in the suite of Utilities Taxonomies. It is the perfect companion taxonomy for any company that provides both Water and Wastewater Services to their customers. Both should be used in conjunction with the WAND Utilities Taxonomy. For municipalities that also provide gas and electricity to their customers we have the WAND Gas Utilities Taxonomy and the WAND Electric Utilities Taxonomy to round out the Utilities Suite. As with all WAND Taxonomies, the WAND Wastewater Utilities Taxonomy is available separately or as part of the WAND Taxonomy Library Portal.